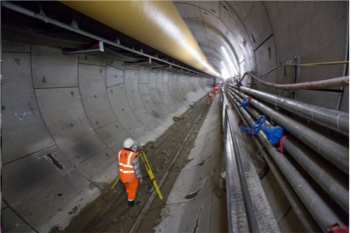 Funding difficulties could put back the full opening of Crossrail 2 by a decade, according to an unpublished document from Transport for London (TfL). The Financial Times reported that TfL had warned in a business case document that the new north-south London rail link may have to be delayed into the 2040s, beyond its planned opening date of 2033, in order to slow down the rate at which funding is required. According to the FT, the document puts forward as an option: ‘Extend construction over a longer period and open in stages, with full services operating by the early 2040s.’ The FT said the business case noted that the idea of phasing in Crossrail 2 services had previously been found to be ‘feasible’. The Government has yet to give formal approval for the scheme, although it has worked with TfL to explore how it will be funded. In the business case, which was written in March, TfL said it would be unable to borrow the money to pay for its share. It said: ‘TfL and the GLA’s [Greater London Authority] balance sheets are considerably more highly geared than they were in 2007 when the Crossrail 1 funding arrangements were agreed, in significant part due to investment in Crossrail 1 and other transport improvements. A spokesperson for the Mayor of London told Transport Network: ‘Crossrail 2 is essential for the future prosperity of London and the South East. The proposal is due with DfT 'shortly,' a spokesperson said, however he declined to comment on claims that the construction period would be extended. TfL says it has always been committed to London paying for half of Crossrail 2 - £30bn at 2014 prices.